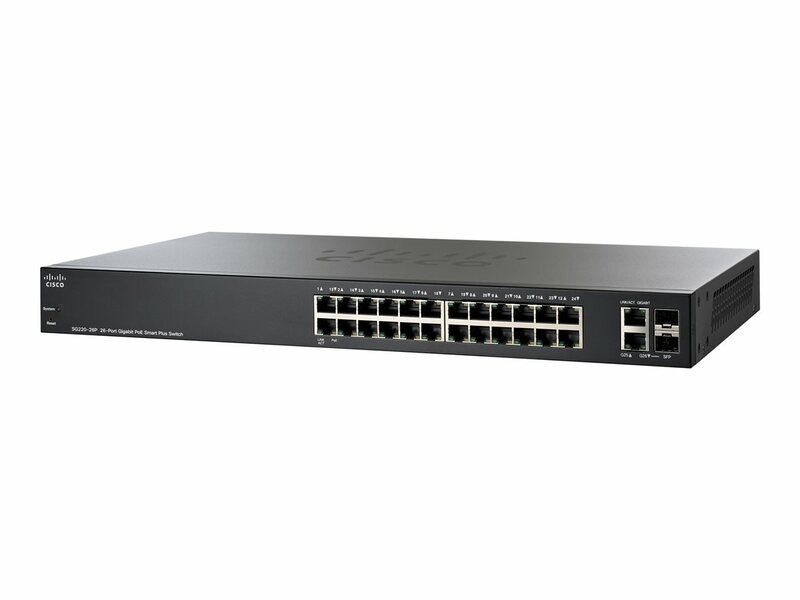 The Cisco SG220-26P is a 24 Port Gigabit Smart Plus Switch with 2 Gigabit Combo Ports (RJ45 + SFP) and 24 ports of PoE is an affordable smart switch equipped with enhanced security, intelligence and performance. For small and medium-sized businesses running on a tight budget but still requiring a solid network, these switches deliver an excellent combination of features, performance and ease of use to build a fast, reliable and highly secure network - at a lower price than managed switches. Power over Ethernet (PoE): PoE and PoE+ streamline the deployment for wireless access points, IP telephony and video surveillance by allowing power and data to run over a single network cable. Value: Enjoy the affordability of smart switches while getting the higher levels of security, management and scalability only found in managed switches. Enhanced security: Cisco switches offer several security capabilities, including advanced threat defense, access control lists (ACLs), 802.1x, and many others. You can be confident that you have the protection you need. Easy setup and management: Intuitive browser–based tools simplify setup and configuration. Advanced command line interface (CLI) management options are also available. Secured desktop connectivity Cisco 220 Series Switches can quickly and reliably connect employees working in small offices with each other and with all of the servers, printers, and other devices they use. With device authentication and access control, you can maintain the integrity of key business information while keeping you employees connected and productive. Flexible wireless connectivity. With comprehensive security and quality of service (QoS) capabilities, Cisco 220 Series Switches provide a solid foundation to add business-grade wireless to the network. You can easily move up to a cutting-edge 802.11ac wireless access point to increase workforce productivity without worrying about power and throughput. Unified communications. 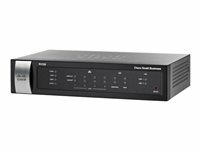 The Cisco 220 Series Switches provide QoS features to automatically prioritize delay-sensitive traffic to help you easily deploy an IP-based communication solution on a converged network. Cisco offers a complete portfolio of IP telephony and other unified communications products designed for small businesses. Cisco 220 Series Switches have been rigorously tested to help ensure easy integration and full compatibility with these and other vendor products. A higher level of security and intelligence. ACLs and flow-based QoS give you more control over network performance, maintain the integrity of key business information, and can enable higher network efficiency. Cisco 220 Series Switches are easy to deploy and use, not only for small, self-installed deployment by non-IT professionals, but also for mid-scale deployment by IT engineers. These switches provide more management options like Cisco CLI, Simple Network Management Protocol (SNMP), Cisco Prime™ LAN Management System (LMS) integration, besides the intuitive, web-based interface and Cisco FindIT utility. streamlines the deployment for wireless access points, IP telephony, and video surveillance by allowing power and data to run over a single network cable. In addition to PoE support on all copper ports, Cisco 220 Series Switches also support PoE+ on selected ports, which is up to 30 watts of power per port. PoE+ can enable deployments for 802.11ac wireless access points, Pan Tilt Zoom (PTZ) IP cameras, videophones, and thin client devices, delivering more flexibility and investment protection.